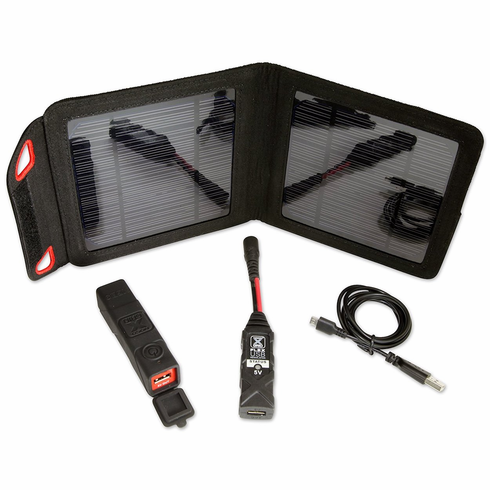 The XGS4USB USB Solar Charging Kit provides you everything you need to keep your favorite devices fully charged, like smartphones, tablets, cameras and more. Easily store power during the day to recharge your iPhone, iPad, and GoPro. Its extremely compact and lightweight design allows it to be stored anywhere, including backpacks and perfect for hikes, hunting and camping. Power your USB devices while on the go, like an iPhone, iPad, and GoPro and more. Freely collect solar power on any adventure to recharge your devices later. Get over 30 hours of additional talk-time and 200 hours of audio playback. Recharge an iPhone 6 once, and a GoPro or handheld GPS up to three times. An ultra-compact and lightweight design that won't weigh you down - only 13.4 ounces. Flexible, non-breakable solar cells that's water and UV resistant for extreme environments.